A diagram showing the projected motion of the newly discovered Uranian Trojan 2011 QF99 over the next 59,000 years. The red square shows its current position. Planetary scientists have detected a Trojan -- an asteroid-like object that shares a planet's orbit -- circling the sun ahead of Uranus. The discovery of 2011 QF99, the first of its kind for the ice giant planet, was reported Thursday in the journal Science. According to first author Mike Alexandersen, a doctoral student in astronomy at the University of British Columbia in Vancouver, Canada, it happened almost by accident. Studying images snapped using the Canada-France-Hawaii telescope during 2011 and 2012, Alexandersen and the team noticed one object that was moving across the field of vision more quickly than the others, an indication that it must have been closer to Earth than the rest. That wasn't a surprise, but seeing an object that moved the way 2011 QF99 did was a shocker. The scientists had expected to see objects known as Centaurs, which often move inward into the solar system along quirky paths. But over the course of a year of observations they realized that this space rock was traveling in an orbit very much like that of Uranus, which made it seem more like a Trojan, gravitationally bound to its planet. The mysterious object also oscillated the same way a Trojan would. "It was, in fact, a Trojan," said Alexandersen, who added that the team "were certainly not anticipating finding something as cool as this." UCLA planetary scientist David Jewitt, who is credited with detecting the first Kuiper Belt object in 1992, said that the transneptunian region is the source of all sorts objects hurtling about the solar system, providing an Armada-like "rain of stuff" cascading inward toward the sun. As they move through the solar system, these objects get caught up in planets' gravity, either getting hurled away or thrown further inward. Chunks that float around in the zone of the giant planets are called Centaurs; those that make it into the inner solar system, heating and vaporizing in the sun's heat, are known as comets. Trojans are the bits that get captured in particular locations in a planet's orbit where gravity from the sun and gravity from the planet interact to lock them in place. Some Trojans, around Mars, Neptune and especially Jupiter, are permanently bound to their planets, and have been for billions of years. Others, like 2011 QF99 and Earth's Trojan 2010 TK7, are only temporarily trapped in their orbits. "The planets are playing ball with this thing," Jewitt said, of the newly detected object. "Eventually they'll lose control of it." In their report in Science, Alexandersen and his co-authors described results of a computer simulation that showed that the object was only temporarily bound to Uranus, and that it was likely to drop out of its orbit, becoming a Centaur, within a million years. They also calculated that around 3% of the minor objects in the giant-planet region were likely to be co-orbiting with Uranus or Neptune at any given time. "That was higher than we thought it would be," Alexandersen said. The IAU, which names such bodies in the solar system, may decide to give 2011 QF99 a different name eventually. "We may get to send them a suggestion," Alexandersen said. For now, he will use the remaining few days of scheduled telescope time to continue tracking the Trojan this fall, but "probably won't study this a lot more," shifting gears to work on the "planned part of my thesis." But 2011 QF99 was "a surprise chapter" that will "certainly make its way" into the final draft, he said. 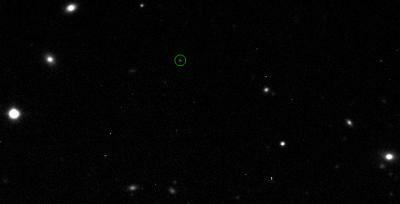 This is one of three discovery images of 2011 QF99 taken from CFHT on 2011 October 24 (2011 QF99 is inside the green circle). This is the first of three images of the same patch of sky, taken one hour apart, that were then compared to find moving light-sources. 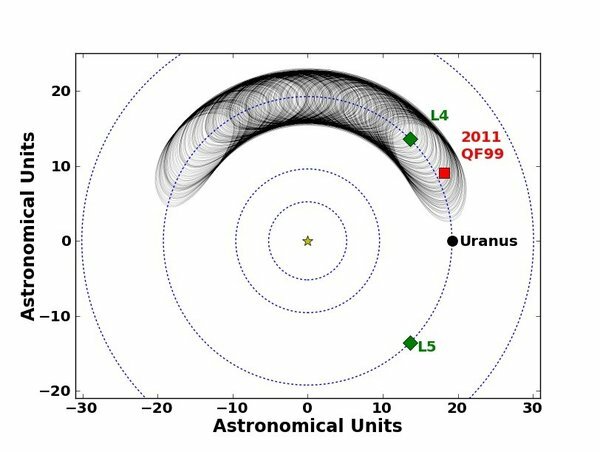 BC astronomers have discovered the first Trojan asteroid sharing the orbit of Uranus, and believe 2011 QF99 is part of a larger-than-expected population of transient objects temporarily trapped by the gravitational pull of the Solar System's giant planets. Trojans are asteroids that share the orbit of a planet, occupying stable positions known as Lagrangian points. Astronomers considered their presence at Uranus unlikely because the gravitational pull of larger neighbouring planets would destabilize and expel any Uranian Trojans over the age of the Solar System. "Surprisingly, our model predicts that at any given time three per cent of scattered objects between Jupiter and Neptune should be co-orbitals of Uranus or Neptune," says Mike Alexandersen, lead author of the study to be published tomorrow in the journal Science. This percentage had never before been computed, and is much higher than previous estimates. Several temporary Trojans and co-orbitals have been discovered in the Solar System during the past decade. QF99 is one of those temporary objects, only recently (within the last few hundred thousand years) ensnared by Uranus and set to escape the planet's gravitational pull in about a million years. UBC astronomers Brett Gladman, Sarah Greenstreet and colleagues at the National Research Council of Canada and Observatoire de Besancon in France were part of the research team.